(CBS/AP) Why are so many kids falling from windows? 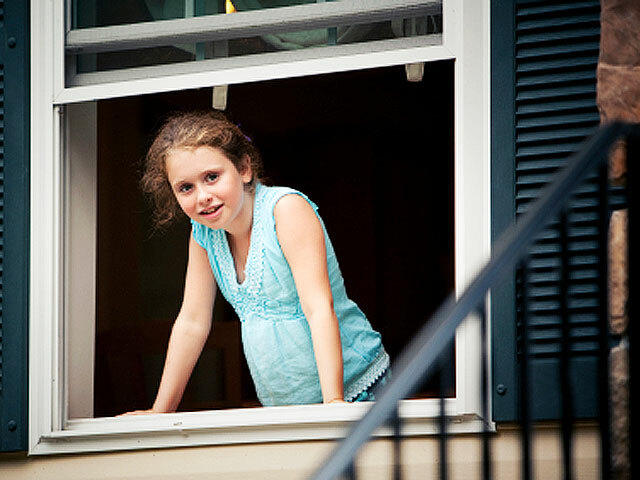 Each year in the U.S. more than 5,000 kids and teens fall out of windows, ending up in the emergency department, according to a new study. That's 14 per day. And it's not just urban kids who are getting hurt - the study found most falls are from first and second floor windows. "This is more than just a big-city problem," said study author Dr. Gary Smith, director of the center for injury research at Nationwide Children's Hospital in Columbus, Ohio. Beth Harlan, suburban mother from Galloway Ohio, knows that's true. Two years ago her 6-year-old daughter, Sidney Dillon, was sitting on the sill and leaned against the window screen before falling two stories. By the time Harlan walked into the room, it was too late. "I came upstairs just in time to see her falling," Harlan said. Luckily, Sidney fell into a bush and landscaping mulch without breaking any bones. But, the accident frightened both mother and daughter. "Don't ever think that kind of thing can't happen to you," Harlan said. "Never in a million years, when I opened up the window, did I think my kid would decide to sit in a windowsill." But 6-year-old Sidney was older than the average age of children who fall. The study -published in the August 22 issue of Pediatrics - showed preschoolers are at the highest risk for falls and suffer more head injuries than older children. "Two-thirds of these injuries occurred among children younger than 5," Smith said. This is the age group that's mobile, curious and does not recognize the danger of falling from a window." For the study, researchers analyzed data from emergency departments from 1990 through 2008, and found an estimated 98,415 children were hurt during that time. The researchers found less than 1 percent of cases led to deaths, but researchers said the tally likely underestimated fatalities because not all children who die from injuries are brought to the ER. Other results showed summer months -when windows are left open - saw the most injuries, while one- and two-story falls made up 94 percent of the falls where height was recorded. Overall injury rates from falls have declined 4 percent over the past 19 years - the average yearly injury rate was about 7 injuries per 100,000 children. According to Smith, increased awareness of the danger, improved window construction and the use of window guards - that allow windows to open but keep children from falling - may explain the decrease. Some towns may want to take a lead from the big cities to stop falls. New York City achieved decreases in injury rates through public awareness campaigns and laws that require window guards in apartments with kids age 10 and younger. "The public awareness campaign is an important first step in building consensus," said Dr. Andrew D. Racine of New York City's Montefiore Medical Center, where window fall injuries are now rare. "But not until you get the mandatory regulations in place are you going to see the kind of impact you're trying to achieve." Besides window guards, which cost $20 to $40 and have a quick release feature that allows escape during emergency, experts say parents should move furniture away from windows and open windows from the top, if possible. Dr. Robert Glatter, attending emergency physician at New York City's Lenox Hill Hospital, told CBS News in an email that cushioning bushes or flower beds below windows "may reduce the chances of a major injury" if a child falls. "We know what works and yet we still have over 5,000 children a year being rushed to emergency departments because of falls from windows," Smith said.